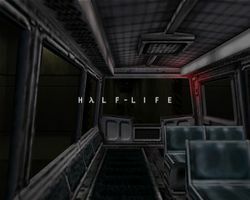 Half-Life is comprised of 18 levels full of action and suspense. Each level is split into smaller areas with loading zones. These load times are very short on all versions of Half-Life and never interrupt your game. This walkthrough will provide you with information on what to do and where to go. This guide is meant to be spoiler-free, so no plot details will be revealed here. Make sure you know the controls first for the PS2 version, and if you have the PC version, make sure your assigned controls are good to go. If you would like to go to a certain section or chapter of the guide, such as the weapons, enemies, or versions section, use the Table of Contents. The famous introduction of Half-Life. To start a new game, simply select 'New Game' for all versions of Half-Life. You will be able to choose your difficulty (Easy, Normal, or Hard) before you start the game. In Half-Life: Source, you can choose your difficulty in the options menu. If you would like, you can try out the Hazard Course, which is a tutorial for Half-Life. It is highly recommend if this is your first time playing Half-Life, as it gives basic information that is vital for your survival. The Hazard Course is a very short stage, and can be accessed from the Main Menu of Half-Life. You can also access the multiplayer option (all versions) and the Decay mission (PS2 only) from the main menu. Half-Life has no cutscenes and the entire game is presented through the eyes of the main character. This page was last edited on 21 August 2007, at 02:38. This page has been accessed 246,874 times.